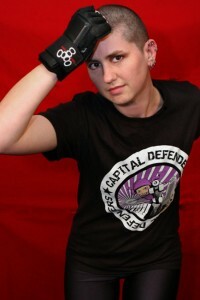 Red Stick Roller Derby | April’s Capital Defender of the Month: Jewels Burn! April’s Capital Defender of the Month: Jewels Burn! What’s the story behind your name and number? My name refers to Jules Verne, one of the fathers of science fiction. My number is atomic number of Cobalt, my very favorite element. It burns blue and you can make bombs with it. This season I’ve been Jammer and Pivot. I’ve only recently started Pivoting and I like it. I need to practice yelling so everyone on the track can hear me. What is your favorite thing about derby? What first attracted you to the sport? I think it might be because it’s a team sport that’s played inside! I enjoy playing team sports and I get sunburned easily. I enjoyed skating as a child (but didn’t do it that often) and when I heard about roller derby, my friend and I got some skates and skated around for a few months before I joined RSRD. Find or make a place for yourself, make your own fun. To have fun. I’m not super competitive and I like that there is always a place for everyone in our league. Everything happens so fast out there it’s hard to remember. I always remember the times I’m jamming and the other jammer gets lead, and then gets sent to them box. I just have to keep skating until the 2 minute jam is up because neither of us can call it off. I remember our coaches were both yelling at me to keep skating! Two minutes can be a long time. I’m always changing it up. Except for my skates. I’ve got a pair of Riedell 595′s with SureGrip Probe plates that I’ve been skating on forever. I haven’t really had a lot of other options with skates though since I have a narrow foot and a lot of the newer skate companies have either just started coming out with narrow width or still haven’t come out with one yet. I think I’m going to have to hold off on another pair of skates until I can try some on in person. I made a skating playlist. It’s got a fair amount of Pennywise (“Nowhere Fast”, “Watch Me as I Fall”) on it. I would arm wrestle Ellen Ram Page. She cracks me up. I think I would lose hilariously. I played softball and basketball when I was little. I took dance lessons all through school. In college I played a little bit of co-ed soccer and one semester on the women’s rugby team. I’ve always got some sort of crafty project I’m working on. I knit and crochet. I recently relearned how to sew. Sometimes I paint. Lately I’ve just been curling up, reading, with a cat or two in my lap. I also have a weekly Dungeon’s and Dragon’s group. Do it. Go ahead and get yourself a pair of skates, it’s much more fun than skating on rentals. Get some knee pads and wrist guards, minimum, and don’t be afraid to wear them. Practice by yourself or bug one of your friends into skating with you. I joined back in April 2009. I started as a skater and played the very end of the 2009 season and the beginning of the 2010 season. Then I reffed for the rest of 2010 and the 2011 season. 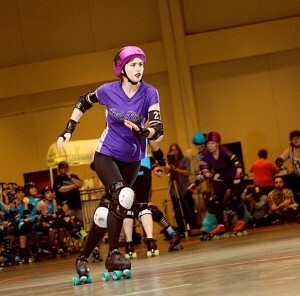 I came back as a skater with the 2011 fresh meat class and skated on the Capital Defenders for the whole 2012 season.